The Mount Everest base camp tour is awesome! begins with the footsteps of Sir Edmund Hillary and Tenzing Sherpa and ends with an ascent of Kala Pattar hill station. Kalapatthar – mountain black stone is a little peak famous hill station to observe Mount Everest and many other tallest mountains of khumbu region. Moreover, you can see the tallest mountains, brilliant landscapes, the high mountain villages, and Buddhist monasteries. The everest base camp trek 12 days is an opportunity to experience the local Sherpa hospitality. Our everest base camp tours is in Sagarmatha national park (listed in UNESCO world heritage sites) is outstanding to see the highest mountain of the world, mount Everest at 8,848m, and many of the world’s 8,000-meter mountains such as Lhotse, Cho Oyu, and Makalu. 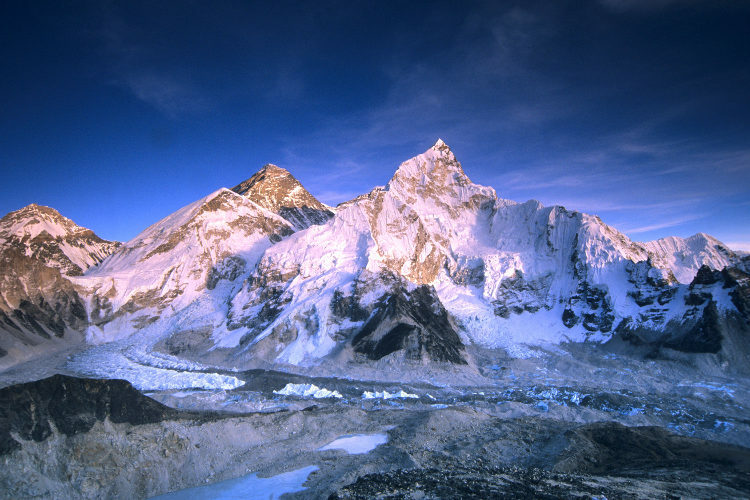 Hike everest base camp elevation – height is about 17,600 feet above sea level. It is possible to ascend 7 days and descend 3 days above Lukla. Lukla airport is very busy and crazy, especially in the tourist season. Everest base camp trek cost is roughly about 1,225 as a minimum to cover your all meals and domestic lukla flights. According to the Gokyo Trek tour operator agency, Everest Icefall – khumbu glacier with huge ice pinnacles soaring to unbelievable height before reaching the Basecamp. Furthermore, it is suitable for all age walker looking for something a little more challenging and energetic. Our program always includes rest days and build up gradually, in order to acclimatize to the altitude. The trail goes straight forward to lukla airport landing, follow the river valley to mount everest base camp. If it is not for the altitude, the EBC trek slightly climbs every day. The ebc trek route has moderate difficulty because of treeless and lack of oxygen. The viewpoint from Kala Patthar on your return journey is the highest point standing at 5,550 meters but technically an adventure trek to go slow. Along the Everest base camp trek route, you can walk at your own pace, with plenty of stops for rest. So, hire our expert guide to make your best everest base camp tours unforgettable. A trip to Everest base camp possible to explore in anytime throughout the year. The tour about ebc 12 days itinerary compared to most walks in this region leading up to the mount everest base camp. The particular route is designed for world travelers who wish to hike to the base camp of the spectacular mountain but are restricted time-wise. Travelers who wish to reach the Everest base camp in a more relaxed manner can try ebc trek itinerary however if this itinerary is not ft you than send us an inquiry for tailor-made itinerary. How much does Everest base camp trek-tour cost? The everest base camp trek 12 days available now on USD 1,225 Per person but the price will vary according to group size. For deluxe and luxury trek plan, we add 3-star hotel deluxe air-conditioned room in Kathmandu and Tourist standard accommodation with attached toilet while on a trek on possible places. AND WE ARE OPEN TO CUSTOMIZE YOUR TOUR AND PACKAGES PRICE AS PER YOUR REQUIREMENTS. International tour leaders are highly encouraged to get discount and attractive complimentary. We can organize private trek to express everest base camp tour starting at any date that works for you. Please contact us for more information. Question: Do I need walking polls for Everest base camp tour? Discover the best Himalayan view in 360 deg angle from Syangeboche hill and from Kalapatthar. Everest base camp tour notice. We booked our trek to EBC via Ammar at Gokyo Treks. He booked our flights, organise our trekking permits, and guide. He also advises how much we would need to spend each day whilst trekking. Whilst we were booking our trek with Ammar we met a guide who had just returned from EBC who told us what to expect. When we arrived in Lukla we were met by our guide. We did have to book a porter after two days but our guide was helpful in arranging this. Ammar kept in touch with us during our trek to see how we were and to check the trek was going well.